1. 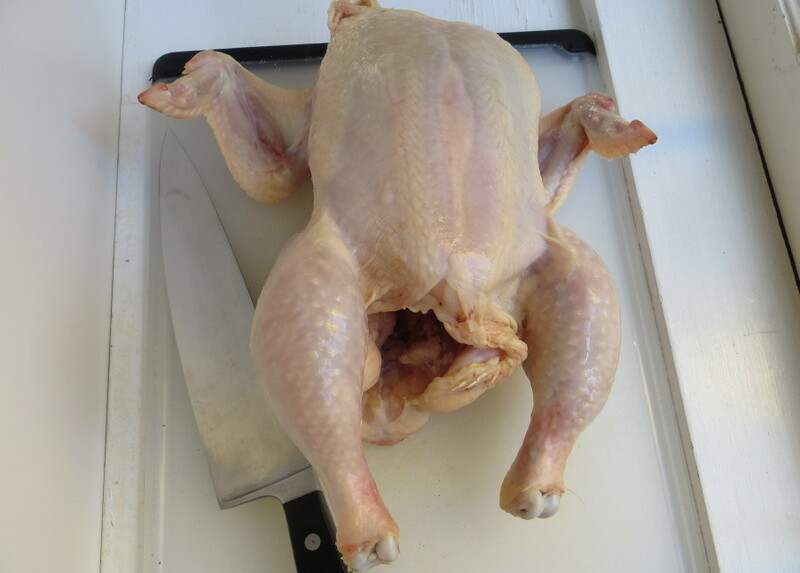 Prep the chicken: Cut a 4-lb chicken into 8 pieces. 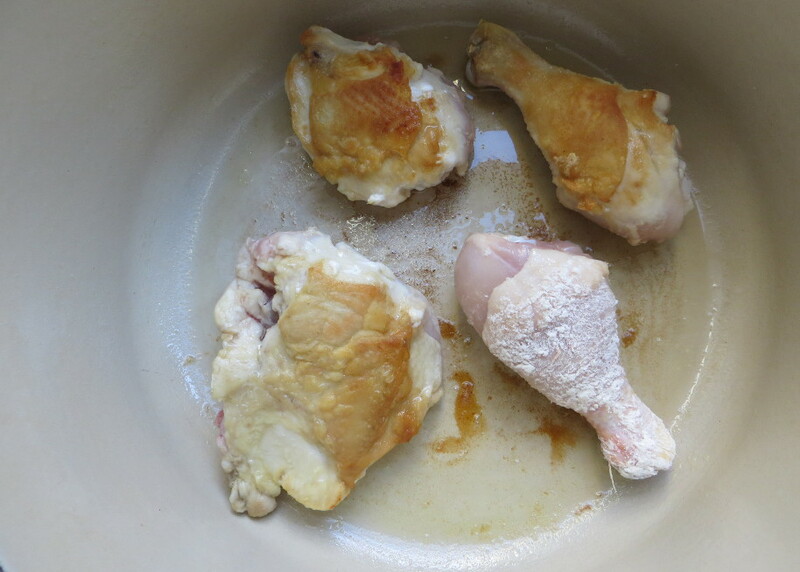 Rinse the chicken pieces with cold water and then pat dry (make sure the chicken is completely dry). Sprinkle generously with S+P (about 2 tsp. salt and 1 tsp. pepper). Set 1 cup all-purpose flour in a shallow bowl. 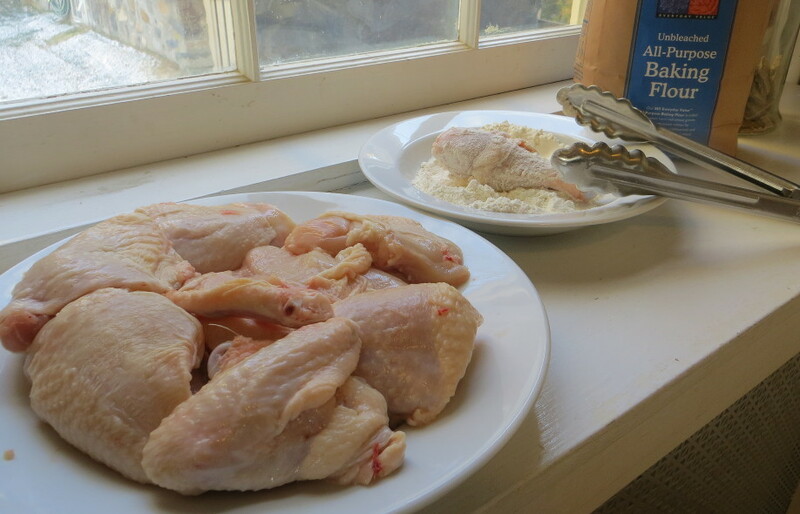 Dredge the chicken in the flour, shake to remove excess, and set on another plate. 2. Sear the chicken: Heat a heavy-based pot over medium-high heat for 1 1/2 min. Add 2 Tbs. olive oil and once it’s shimmering hot, about 30 seconds, add half of the chicken, evenly spaced. Reduce the heat to medium and cook, undisturbed , until the chicken browns around the edges and easily releases when you lift up an edge, about 2 minutes. Flip and brown the other side, 2 more min. Transfer to a large plate, add another 1 Tbs. olive oil and brown the remaining chicken in the same manner and transfer to the plate. 3. Sear the aromatics: Add a final 1 Tbs. olive oil to the pot as well as 2 garlic cloves (smashed), 1/2 tsp. 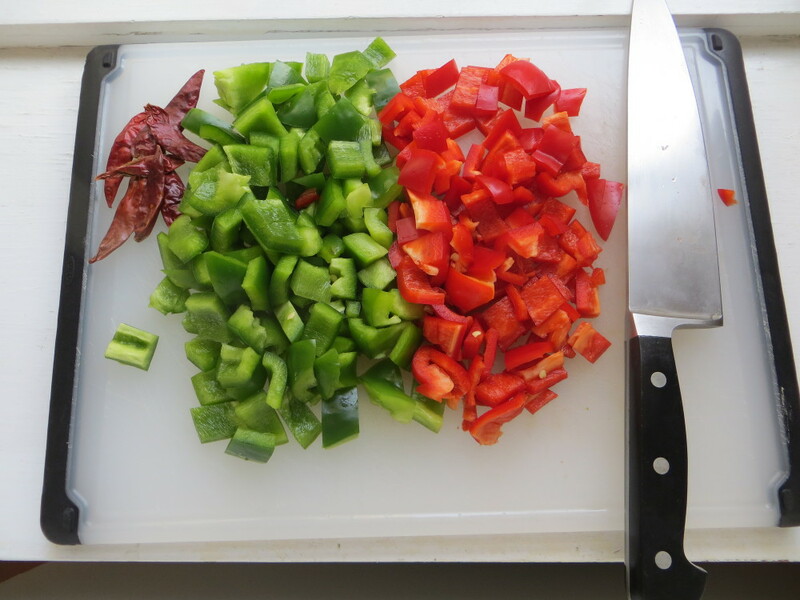 crushed red pepper flakes, 1 large red pepper (1/2-inch dice), and 1 large green pepper (1/2-inch dice). Raise the heat to medium-high, sprinkle with 1/2 tsp. 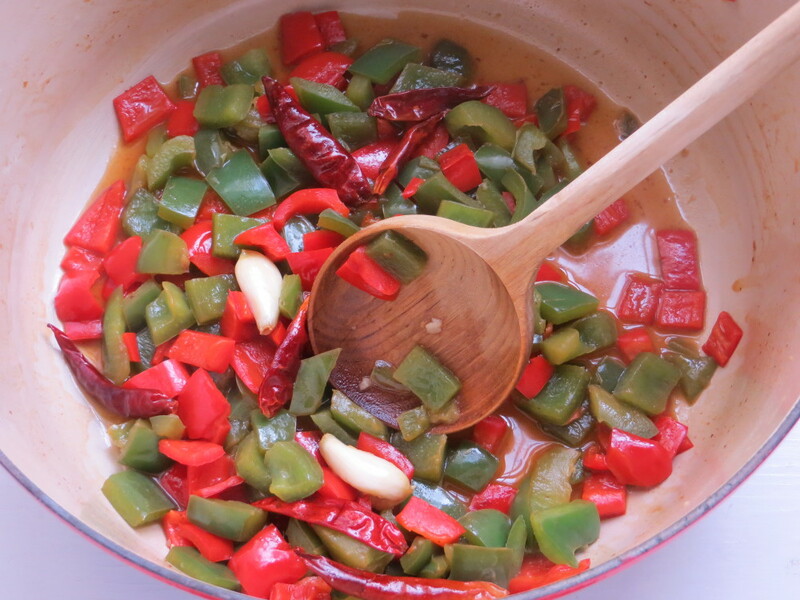 kosher salt and cook, stirring occasionally, until the peppers soften completely, about 8 minutes. 4. Braise the chicken: Add 1/2 cup white wine to the pot and cook, gently scraping the bottom with a wooden spoon to incorporate any browned bits, until the liquid cooks off, 1 to 2 min. 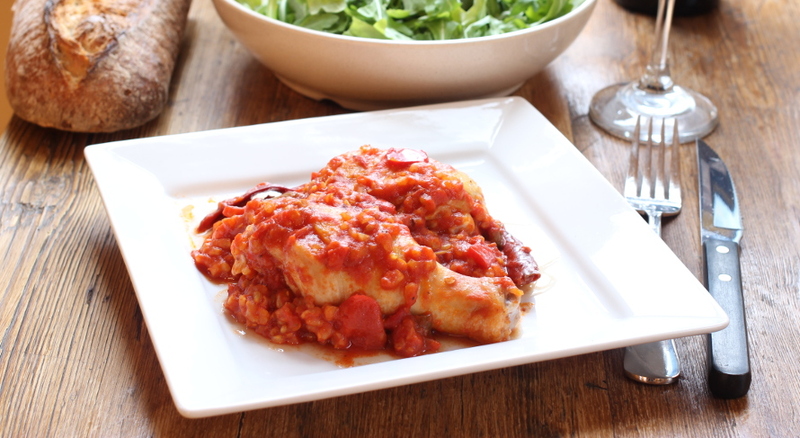 Add a 28-oz can whole tomatoes (pureed with their juices), 1 cup chicken broth and 2 bay leaves and bring to a simmer. Reduce the heat to medium-low, nestle the chicken into the pot along with 1 cup medium-grain brown rice, cover, and cook, stirring occasionally, until the chicken cooks through and the rice becomes tender, about 1 hour. 5. 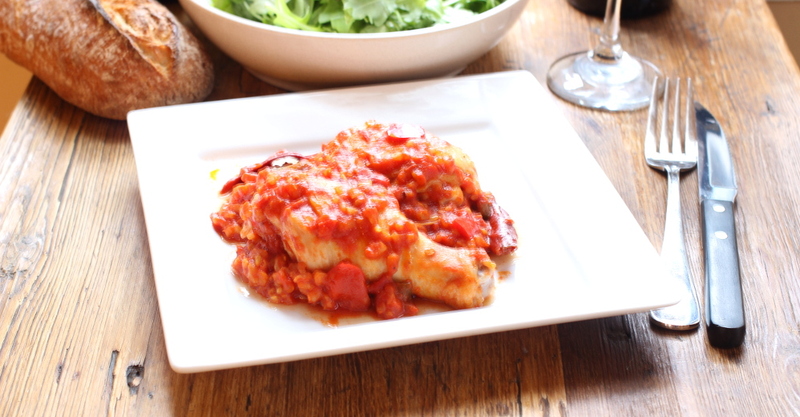 Serve the brothy chicken and rice in shallow bowls with a good baguette and a green salad.